What's This Web Site All About...? Here you will find some two hundred fifty web pages and over twelve hundred drawings and images. The Site Map is a handy index to it all, and the News Page highlights what has recently been added. Some have asked why I have bothered to put so much information on the web, and for free...? CUSTOM DESIGN INFO: Our main focus is to create new Custom Yacht Designs. Whenever possible we will then develop those designs for NC Cutting. EXISTING DESIGNS: A variety of our designs ranging from 8 to 165 feet are linked from within our Motor Yacht and Sailing Yacht pages. They include large and small ocean-sailing craft, long range trawler-yachts, fast motor yachts, an occasional multi-hull, and even a few sailing dinghies... A list of our existing designs can be found on our Plans List Page. PROTOTYPE DESIGNS: If one of our existing designs will not exactly meet your requirements, you might find good inspiration among our various Prototype Designs in order to create a new design. ARTICLES: Our boat-related Articles are intended to explain my design philosophy, and to help answer a variety of preliminary questions about boats, boat building, and boat design. What is that special characteristic that makes a boat beautiful? What allows a boat to behave well under way? To return to port in good shape after a long passage? What makes the crew comfortable? What provides a good turn of speed? These are highly predictable qualities. In pursuit of those essential qualities my goal is to create the most practical design that will suit the intended service. I have built boats and I've owned boats. I've also cruised, voyaged, and raced in them coastwise and in the open ocean. Those real-world experiences are brought into each design, from its imagining, to its analysis and detailing, through to its construction and... at last, to boating...! Performance, sea keeping, strength, economy and style... these are the qualities to be pursued for one's habitat on the water. Our use of the word 'habitat' is quite intentional, for if the design is successful one will feel very much at home while onboard. Our aim is to engender refined aesthetics along with safe and comfortable boating. At the core of our approach to boat design is the desire to create ocean capable Nomadic Watercraft. By this, I mean truly pelagic blue water boats for family cruising and world voyaging, whether power or sail, built in steel, aluminum, wood or composite. Our custom design work starts with listening to the requirements of our clients in order to propose the best solution in terms of vessel type, layout, size and style - in other words, to propose an appropriate form and function to suit the vessel's intended purpose. A thorough analysis of structure, performance and stability is undertaken in order to assure that the resulting vessel will behave and perform as intended. Our overall goal is long term owner satisfaction with the resulting vessel. When creating a new design, we use classification society rules as our guide for structure, and we use internationally recognized criteria to assess stability. When a vessel is destined for construction and use within the European Union, we prepare documentation of ISO compliance to facilitate CE Marking for the builder. We work equally well with the metric system or the Imperial measurement system according to the requirements of the project or the location where the vessel will be built. Please see our Custom Design web page for a complete list of the standards that apply to various boat types in whatever country they may be owned and used. The main ingredients in any successful project are first the client, and then the other primary members of the "team" who are tasked with creaing the vessel. As the design nears completion, the builder becomes an integral part of the team. Each of these primary team members will engage others as needed for their expertise, for example making use of various equipment suppliers and subcontractors for their expertise. Often overlooked are the various members of the designer's own team. Even though the various design team members are highly trained and extremely important to the timely production of drawings, they may not all be visible to the project as it develops. In order to address that situation, please see the Design Team page where you'll find a bit of background about those who contribute to the design process as needed. Our design work is done on a custom basis. Our goal is to provide a complete design service from the moment of imagining a new vessel, through creating the ideal solution to those ideas, to seeing that the vessel gets built as designed. In other words, from the napkin sketch, through the design process, to actual construction and launch. Each new design is a unique solution to the requirements presented. 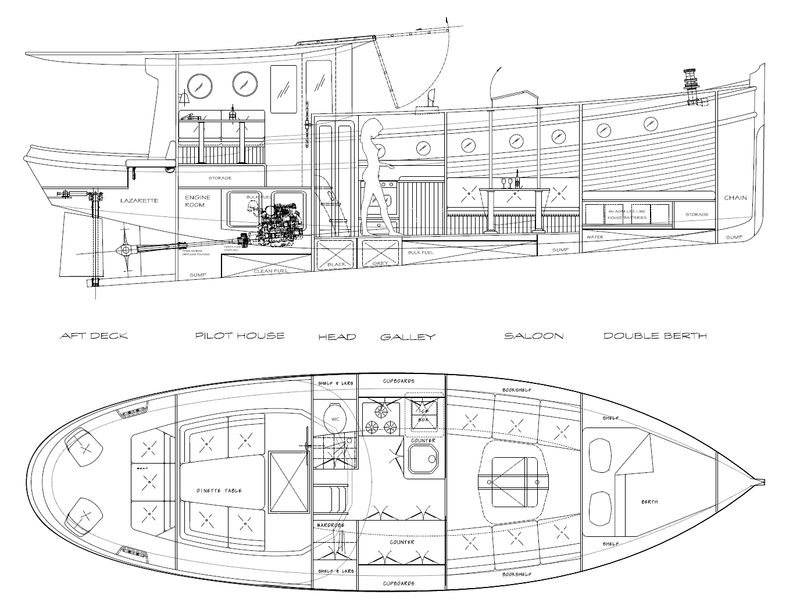 Please review our Custom Design page for a more complete description of the yacht design process. As with any new venture there is first the idea and then the bringing forth of it into a functioning reality. My first task is to learn a client's requirements and to understand what the vessel will be used for, its size, desired accommodations, available budget, preferred equipment, and myriad other details. 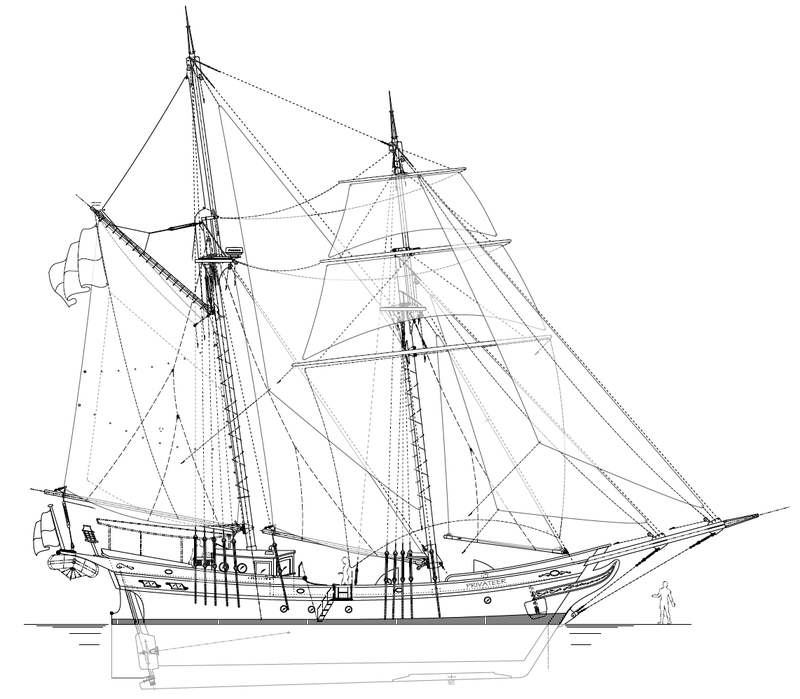 Once the owner's requirements are understood, I'll begin with a preliminary computer generated model of the vessel and its superstructure. Several such models may be seen within our Prototypes web pages. Once the model has been created, a preliminary layout can be sketched and a Preliminary Design Study created in order to coordinate the Layout with the general configuration. After a clear strategy has been established and approved, we will begin to detail the Accommodations and the Rig and how those relate to the Structure. The design is developed first as a few Preliminary Drawings, then as an Estimating Plans Package, and then as a completed set of Building Plans. In addition to the information on our Design Stream web page, it will be instructive to review the PDF files linked from there. Specifically, those which outline our Software In Use and our Design Workflow and Deliverables. For hull modeling, stability and performance analyses, and to streamline the construction process we use the Maxsurf suite of marine design software. NURBS Surface Modeling allows us to quickly optimize the design during its development, so that we can move forward with confidence in order to detail its structure, layout and equipment, and in the case of a sailing yacht or motor sailing vessel, its rig. With the computer generated geometry of the hull and superstructure already having been created, it is a simple matter to leverage that effort via CNC cutting to build the boat, or CNC shaping to create a hull model for towing tank testing. It is also possible to create a styling model in order to preview the look of the vessel in three dimensions. The Maxsurf digital model allows us to precisely detail the structure so that we can develop an NC cutting file package to deliver pre-cut parts to the builder. The accuracy and labor savings that are possible by using a computer cut "kit" are sufficiently compelling that an NC cut structure has become the norm for new construction of metal boats. If the vessel will be professionally built, builders have estimated that the labor saved via NC cutting is on the order of some 35% to 50%. If the vessel will be owner built, the labor saved by employing NC cutting is considerably greater. For the complete story of how we make effective use of CAD throughout the design process, including NC file genesis, please see our CAD Design Stream article. The question is often asked: "Are we 'only' designers, or do we actually build boats...?" BUILDER RECOMMENDATIONS: Our work is mostly limited to creating new designs or modifying our existing designs. But we do get involved in boatbuilding..! Upon the purchase of existing Estimating Plans, or on completion of Estimating Plans for a new design, we will provide a short list of qualified builders and we will assist with the owner's "request for quotes" in search of the right builder. We are always on the lookout for builders who can offer high quality at a good price point. In this way, we are not wedded to a specific builder and we are thus free to make the best recommendation for the project at hand. More detail about our preferred builder list can be found on our Stock Designs web page. As of early 2015, the 61' Mermaid is now under construction in the US with full USCG approval for tall ship charters in the Chesapeake. Construction of a motor sailing ketch, the 42' Lucille, is taking place in Thailand with full EU-RCE / ISO compliance. The 56' Shiraz is now being completed in the Philippines with construction managed by a crew from Australia. Our 53' Valdemar, 43' Roberta Jean and 44' Redpath designs were recently completed in Canada. Several of our large Wooden Charter Yacht designs have been or are now being built in Indonesia, ranging from 66 feet to 164 feet on deck. A number of our motor and sailing yacht designs have been built in various places including the US, Canada, Australia, New Zealand, the Philippines, Turkey, Thailand, the EU, Central and South America, and Russia. As is inevitable, several of our designs have been emulated, copied, and even outright ripped off, so there have been many more boats built to my designs, most of which I do eventually hear about. CNC CUTTING: For our metal boat designs we actually get involved in building the boat "virtually" as we develop the CNC Cutting Files. By this means we will have already built the boat right here on the computer. We then send the nested parts as CNC Cutting Files via email to a metal cutter near the builder, regardless of their location. When the design, documentation, and cutting are completed, if we are invited to do so by the owner we will provide any level of support during construction that is requested, including on-site inspections for quality control or prior to release of funds for the next stage of construction, or analysis during sea trials. Isn't a custom designed yacht expensive...? It may come as a surprise to discover that the cost of creating a new and completely unique yacht design is actually less than the usual brokerage fee charged for the simple act of signing a few papers in order to purchase a new or used boat..! But isn't building a new custom yacht expensive...? When you consider that there are no builder advertising costs, no 'commissions' paid, and no yacht broker fees involved, custom building can actually be very cost competitive when compared to production-built boats that will always incur the overhead of substantial advertising and sales commissioin costs. The design process begins with the prospective boat owner who defines the intended purpose of the vessel, its overall size, preferred materials, required accommodations and so forth. Ideally, these requirements will be articulated in a brief 'mission statement' and maybe a few simple sketches to communicate the concept. With that as a guide, our job is to work with the owner to create the right design solution to suit those requests. Our Custom Design page provides a complete description of the design process and outlines the possible benefits of creating a new yacht design. If this process is of interest for your project, please inquire. I'll be pleased to send you my usual written Design Proposal via return email. It is an outline of the design process, a list of the deliverable drawings and documents, and an estimate for the design work involved. Nearly all of our current small craft design work is represented on these web pages. Estimating Plans are available for most of our designs. Building Plans and completed NC Cutting Files are available for several of the boats listed on our Motor Yacht and Sailing Yacht web pages. A complete list of our boat plans is on the Plans List Page. Even if one of our existing designs may not exactly match "your own" boat concept, we can modify any of our existing plans to suit your requirements. Between 1995 and 2000, I edited and published the Metal Boat Quarterly for the Metal Boat Society (MBQ Issues #1 through #23). The Metal Boat Society is a non-profit organization begun in 1987 to further popular interest in Metal Boats. Among these web pages you will find a number of Articles that I originally wrote for the MBQ, as well as several of my MBQ Editorials. Links to the MBS and an index to MBQ #1 through #23 can be found here. During my editorship of the Metal Boat Quarterly my focus was to foster traditional aesthetics, responsible design, accuracy of information, to share the tricks of successful metal boat building and maintenance, to educate MBQ readers in matters related to boat design, and to introduce an element of professionalism to what had previously been a rather simple ad-hoc newsletter. My goal was to create a more professionally oriented journal that would rise above the "nuts and bolts" focus of the backyard boat builder in order to also include the "big picture" regarding boat ownership, including their design. What, after all, is more important than the boat part...? My intent was that the Metal Boat Quarterly would become a true resource for metal boats, and would include information relevant to their designers, builders and owners, amateur and professional alike. In other words, a knowledge base beyond the basic "trees" of backyard boat building that would also include a view of the "forest". The Metal Boat Society is still going strong. The Metal Boat Quarterly has been given an entirely new format, including a glossy cover, more pages, photographs and color. Alas... along with those changes, the MBQ has been re-focused on the "nuts and bolts" of boatbuilding to better serve the interests of the backyard boatbuilder. If you'd like to keep track of current events at Kasten Marine Design, please bookmark our News page. We hope you enjoy your journey through these web pages...!